If you download the Chase app (or the Chase Pay app), you can browse offers that you can load to your card just like Amex Offers. Right now, there are several good ones available for 5, 10, 15, and even 30% back! Unfortunately, they are highly targeted, so you have to check your accounts to see which offers you have on your cards. 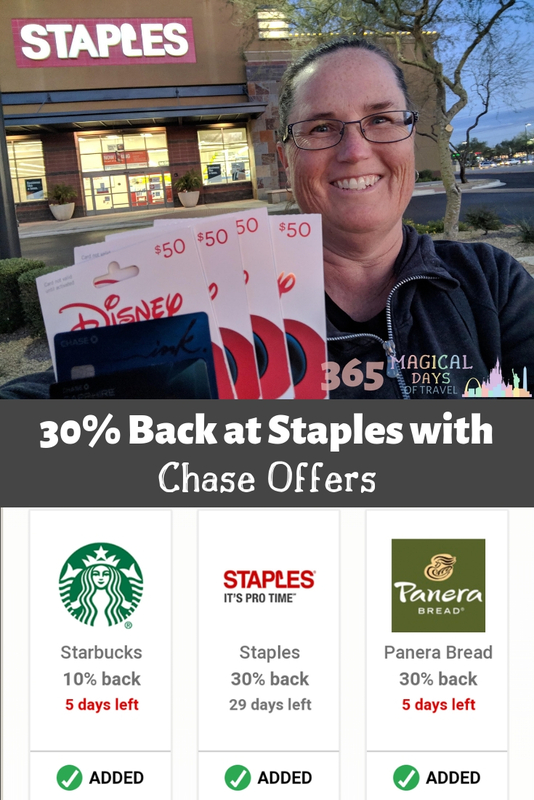 I was super lucky to find a 30% back offer for Staples on two of my Chase cards, my Sapphire Reserve and Freedom. (Bryan had zero, but we will max out the Starbucks offer for him!) The cash back is limited to $19 one time, so that works out to one ~$64 purchase to maximize the offer. 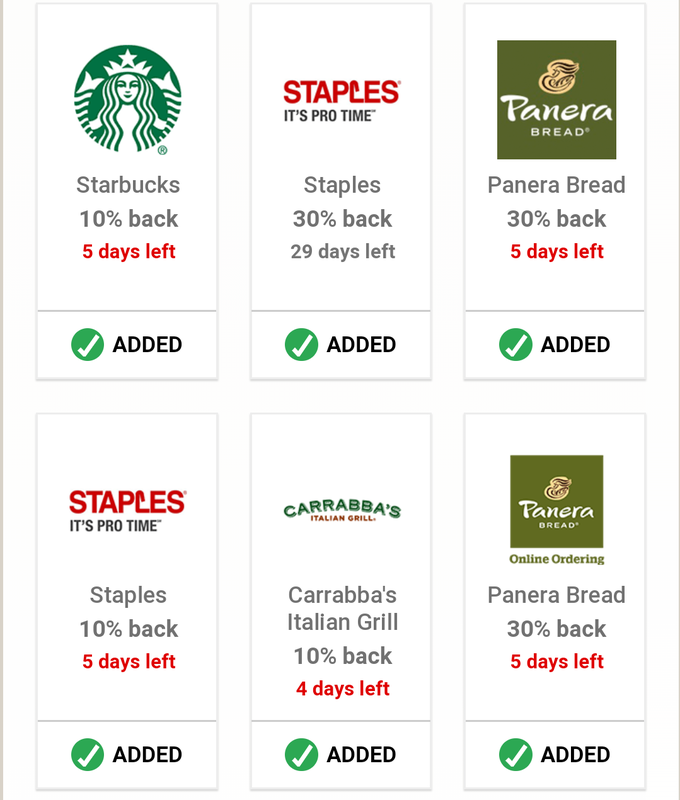 Since Staples allows split-tender payments, I rang up two $50 Disney gift cards and put $64 on the card with the offer, and the rest on my Chase Ink Business Plus, which earns 5x rewards at office supply stores (this link is for the Preferred, but you could downgrade to the Cash after receiving the bonus and earn 5x rewards when paired with a Sapphire product). Then I did the same transaction for the other card that had the offer loaded to it. On $200 worth of cards, I will save $38, plus earn 488 Ultimate Rewards. 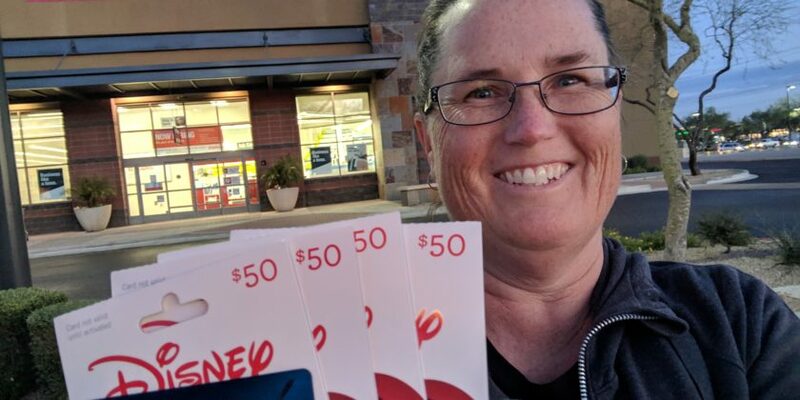 I didn’t need to buy the other $50 card on the second transaction, because I was also buying plastic tubs for the kids’ new toys which would have put me over the $64 limit, but I like to keep my Disney rewards system separate from regular purchases. Otherwise, it’s way too much math! Make sure you add the offers from the Chase app (or Chase Pay app) before you head to the store. You can use this offer online, too, but a $50 gift card will cost $51.99, so it’s a better deal in the store.